If you have the time, then experience the most from Komodo and Flores with this discovery trip. It adds extra time to see all of what Komodo and Flores can offer using our standard route from Labuan Bajo to Maumere. Flores is full of surprises for you to experience and not a better way than to slow it down, take time and soak in the truly remarkable Flores. In addition to the Komodo Dragon adventure, you will encounter all the details for Flores including hiking up volcanoes, visiting remote villages and caves and filling your soul with the locals as they warmly greet you in their paradise. Day 1. Denpasar – Labuan Bajo – Rinca Island. Arrival at Komodo Airport in Labuan Bajo in west Flores, where you will meet our guide and transfer to the pier at Labuan Bajo for boarding our house boat. Lunch on board as we sail about 2 hours to the islands of Komodo and Rinca. We will conduct treks on Komodo and Rinca Islands starting from the wharf and it takes approx. 2 hours per trek. These treks provide the best opportunity to see the dragons and their prey as we pass along dragon nests and out into the sunshine across an exposed savannah that is studded with Lontar Palms. We will also pass a permanent waterhole in Waewaso and across steep, exposed slopes that offer breathtaking views of the islands. Additional local guides are provided to maximize our chances of meeting the Komodo Dragons and to ensure the safety of all travelers. We will have an excellent local dinner prior to overnight on the boat. After we enjoy our morning breakfast at your hotel, we travel by AC coach drive to Ruteng, a beautiful, peaceful town in the western mountains of Flores. 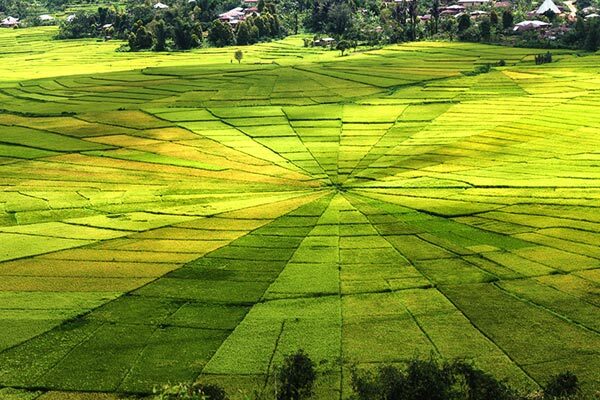 On the way we will visit Mirror Stone Cave (stalactites and stalagmites) and experience the many vistas and sights along the way, such as a visit to Golo Cara to see the spectacular, unique circular rice fields arranged like a spider web. (Lingko/ Lodok). Also, we will stop by a Bena traditional megalithic village in Ngada, Flores before heading to your stay in the charming town of Ruteng. Once in Ruteng, we can relax and tour around this delightful area. Dinner and overnight at the MBC Susteran in Ruteng. After breakfast departure from your Ruteng hotel we will visit Golo Curu with its stunning scenery and the mountains of Mandosawu. Along the north side of the city is eye-catching panorama of more spider rice fields strung along the base of the mountains. We return shortly back to Ruteng and visit the traditional village of Ruteng Puu before you leave for Bajawa. On the way, we will stop at a variety of places in the mountains and along the southern coast of Flores, including Rana Mese Lake and Aimere, where it famous for its “sopi/ moke” distillation and fresh palm juice tapping. Prior to arriving at our hotel in the afternoon, we will take a soothing bath at Soa Hotsprings and experience some of the local life in this area such as at the ancient village of Ngada. Dinner and overnight at Villa Sylverin or Happy Happy Hotel. We arise early in the morning for a departure to Riung. We first stop by at Soa hot spring for refreshing swim and then on to breakfast. We continue the trip to Riung and check in at hotel for the night. We will then immediately transfer to the pier at Riung to take a nice short boat trip to visit the Riung marine park. Our first stop is to Ontoloe Island to experience the amazing flying foxes followed by a trip to Rutong Beach Island. Once there, we can relax and enjoy the Riung Marine Park by snorkeling, swimming and just be lazy. After lunch on the island, we head on back to Riung in the afternoon. The rest of the day is for relaxing as you wish. Dinner and overnight at Pondok SVD or Bintang Wisata Hotel Riung. After breakfast, we continue by driving through the north coastlines of Flores to Mbay and up to Aegela where we view magnificent scenery of mountains and rice fields still as they have been for many years. We will stop in Nanga Penda beach to see the blue stones and continue the drive to Ende where you visit a local market and have lunch. After lunch we drive on to Moni, where we can do some easy, soft trekking in Detusoko. Dinner and overnight at Kelimutu Moni Eco Lodge.